In the special symposiums on IgA nephropathy (IgAN) (Symposium 3, IgAN Basic; Symposium 4, IgAN Clinical/KDIGO) at the last Asian Pacific Congress of Nephrology (APCN) 2014 in Tokyo, discussion by expert nephrologists from Asian and Western countries revealed how actual clinical practices in IgAN, including timing of renal biopsy and choices of treatments, are different, despite evidence-based guidelines. In particular, indication for tonsillectomy with or without steroid pulse therapy for IgAN patients is markedly different between Asian and European-American practices. The tonsillectomy is considered to be old-fashioned in Western countries, while it is still widely accepted in Asian countries such as Japan and China. 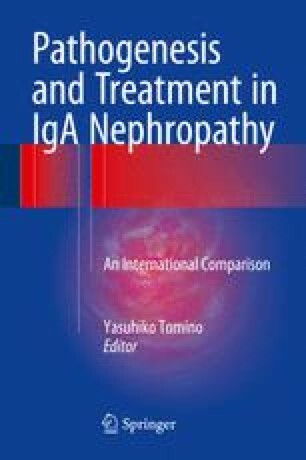 The present chapter discusses rationale of tonsillectomy, with up-to-date understanding of IgAN pathogenesis, and summarizes the actual difference in the IgAN practice with respect to tonsillectomy with or without steroid pulse therapy, such as clinical stages at the intervention, based on some key papers from Asian and Western countries. In addition, we attempt to identify the medical and social causes behind these differences. 1st and 2nd authors equally contributed to this work. We would like to thank all participants in the special symposiums of IgAN in APCN 2014: Prof. Kawamura T, Yuzawa Y, Narita I, Katafuchi R, Yasuda T, Yasuda Y, Yamamoto R, Hirano K, Goto S, Suzuki H, Li PKT, Liu ZH, Chae DW, Zhang H, Barratt J, Novak J, Coppo R, Mustonen J, Glassock R, the Asian Pacific Society of Nephrology (APSN) president Prof. Harris D, and the president of Japanese Society of Nephrology (JSN) Prof. Matsuo S. We also thank NDT-Educational for the possibility to expand the discussion on tonsillectomy in IgAN refining the material for the preparation of this manuscript. Conflict of Interest The authors declare that they have no conflict of interest.